Home // About Us // Connections Newsletter // Connections Newsletter Spring Edition 2015 // Can Making High Tunnels Increase Farm Profits? High tunnels, also called high hoops or hoop houses, are temporary structures used to extend the growing season of fruits and vegetables and are gaining in popularity with area farmers. These covered structures offer some environmental crop protection, but are highly management-intensive. 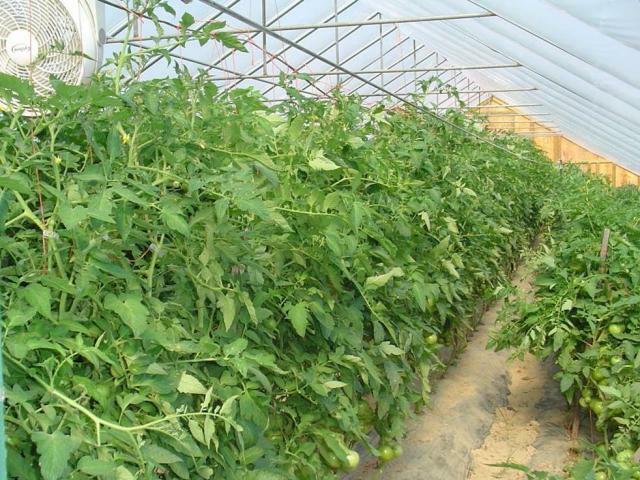 Looking similar to greenhouses, high tunnels provide less climate control and rely on natural passive heating and cooling instead of heaters and cooling fans. High tunnels are constructed in the field to protect crops from the weather (rain, wind, cool or warm temperatures), as well as (in some cases) pests and are less expensive to construct and operate than traditional greenhouses. High tunnels are most often constructed of metal bows which are attached to metal posts, driven into the ground 3 to 4 feet. They are typically covered with one or two layers of 6-mil greenhouse-grade polyethylene, and are ventilated by rolling up or dropping down the sides. There are various designs each offering advantages and disadvantages. Due to their permanent nature, care should be given to siting the high tunnel properly. The gothic style high tunnel is the most popular due to its peaked design which allows for greater height along the sides, making the sides of the high tunnel more useful for crop production and resulting in a 15% greater growing space than quonset-style tunnels. The peak also sheds snowfall, reducing the chance of collapse under a snow load. High tunnels have many uses on the farm. In cooler climates, they are used to elevate temperatures a few degrees each day, resulting in faster plant growth and higher yields. One main advantage of high tunnels is they allow farmers to produce crops outside of the normal growing season, thus meeting consumer demand on either end of the production season, typically when prices are higher. The modified climate inside the high tunnels also creates the opportunity to produce crops that can’t normally grow if unprotected, that may lead to a higher percentage to top-grade fruits and vegetables at harvest. One of the primary disadvantages of the more permanent high tunnels is the fact that they are not easily moved. The result of this is that the same crop is grown in the same location every year, or a very short rotation is practiced. A short rotation or no rotation in vegetable production may lead to yield reductions and, depending on the crop, soil-borne disease development. Another disadvantage to high tunnel production is the lack of exhaust fans for venting during hot weather. In most regions where tunnels are used, tunnels will overheat at some point during the crop production season unless manually vented as the temperature inside the tunnel rises. On warm sunny days, air temperatures in poorly vented tunnels can easily be 40o F greater than ambient outside temperatures. For most farmers, the advantages of high tunnels outweigh the disadvantages. Thousands of fruit and vegetable farms in the U.S. successfully use high tunnels to extend the growing season. A farmer considering high tunnel production should first do some preliminary research and receive training in high tunnel production. To teach Ohio farmers about high tunnel production and how they could adopt this new and emerging technology on Ohio farms, thanks to a USDA National Institute of Food and Agriculture grant, the Ohio State University South Centers hosted a high tunnel training program on April 27 and 28, 2015, at the Piketon Research and Extension Center in Piketon, Ohio. Individual trainings were tailored for the beginner and the advanced grower. This training included hands-on training on six local high tunnel farms and at the South Centers high tunnels.